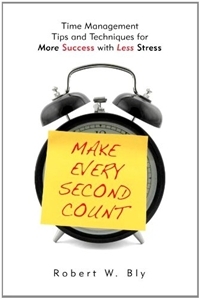 Make Every Second Count: Time Management Tips and Techniques for More Success With Less Stress by Robert Bly presents a collection of time management and productivity tips to help knowledge workers and other professionals achieve greater levels of efficiency. Robert’s productivity methods address personal performance practices as well as the employment of technologies. While the methods presented focus on improving workplace performance, many of these methods are equally applicable to one’s personal life. While the productivity methods presented are commonly known individually, the book itself does a good job at providing a fairly comprehensive and organization collection of productivity enhancers. This book will be particularly beneficial to those new to and entering the professional business world or to those who are reentering the professional workforce after a long-term sabbatical.